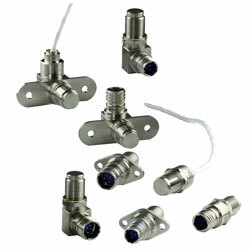 Honeywell’s IHM Series Aerospace Proximity Sensors for commercial and defence aircraft are available from TTI Europe now. The company’s IHM Series reduces downtime and maintenance costs by obviating the requirement for unnecessary preventative maintenance and troubleshooting. The series has a unique circuit that can identify any internal failure modes and present a fault output, instead of a false positive or false negative. The patented technology of the series is considered an improvement over traditional ECKO topology that was standard in aerospace applications. Industry-leading indirect lightning and dielectric ruggedness meet the demands of today’s composite aircraft and challenging applications such as thrust reversers, landing gear and flight controls. Features of the sensors that aid increased flight hours and revenue by reducing maintenance demands include enhanced vibration and EMI specifications that withstand high vibration applications. Packages are fully hermetically sealed, giving long-term reliability in very tough environments by removing potential contamination of the sensor. The company has also created an innovative method of hermetically sealing wire-lead (pigtail) configurations. Devices have an integral health monitoring ability with a third output state showing if the sensor is healthy or failed, thereby decreasing maintenance time, delayed flights and lowering overall maintenance costs over the aircraft lifetime. The non-contact design of the series can sense the presence or absence of a target, even in dirty and challenging environments, removing mechanical failure mechanisms, lessening wear and increasing durability, all of which enhances reliability and minimises aircraft downtime. Applications for sensors include doors (open/closed position, locked status); cargo loading latch detection (pallet locked); evacuation slide door lock mechanism; thrust reverser actuation system (TRAS), (stowed or deployed status); flight controls (flap/slat, spoilers); and landing gear (uplock, downlock and weight on wheels (WOW)). © 2019 All rights reserved, part of Electropages Media. Website & App development by Zeta Digital Agency.